My Dad has a big driveway at his place in Dunnellon, Florida. We usually stop there when we're in the neighborhood. It's been a while since we've stopped there - so I was glad that the weather and schedule cooperated this time. He is acting very appropriate for a Geek's Dad ... the first thing he asked after we got set up was, "Can you set up my new Kindle so it hooks up to my Wi-Fi?" Jim took a few minutes to do that, and the next thing we knew Dad had downloaded a new book and was happily reading away! In the evening, he took us out to dinner at the Blue Gator - right on the Rainbow River. Sure wish we had some time so we could paddle our kayaks down the river. It is such gorgeous, clear, spring fed water. 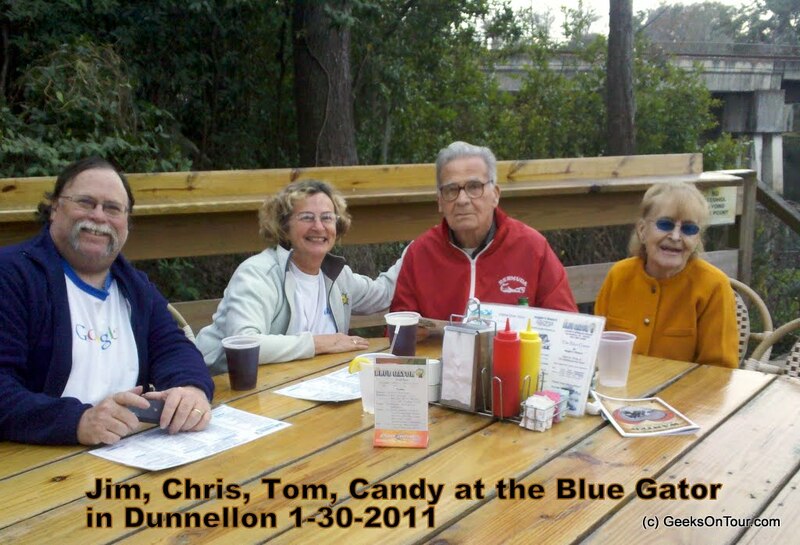 Here's Jim, Me, Dad, and Candy. 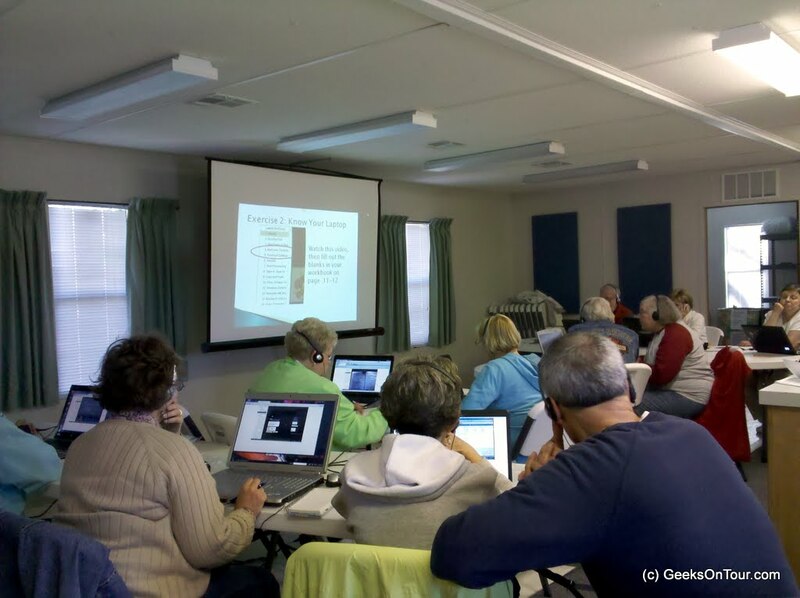 Our 'Geek Week' at Holiday Travel Resort ended with our hands-on Computer Boot Camp. The first time we offered this class, we taught it in a 6 week / 2 nights a week format. Then we did it in a 2 day format. This class was one day, and it is a completely revamped class based on Windows 7 - no XP computers allowed! When we teach it at the FMCA rallies, we do it in 4 hours over two evenings. It really needs the 6 weeks! But, each student gets a workbook and a DVD of videos, so they can use that as a self-study course. I figure if, during the hands on class, they understand how to use the DVD, and pick up a couple of pointers - then it's been a valuable use of their time. We had some seriously glazed-over eyes by the end of the day, but I think everyone learned something. And, I've given them homework via a special forum set up just for the class. If you might be interested in us presenting this class at your park or Rally, let us know OK? The preferred format is 2 days/6 hrs each day. The cost is $120 per couple sharing one computer. This includes the book and DVD. You can also purchase the book and DVD separately for $20. We’re here in Leesburg, Florida at the request of our friend, Roxie. She is active in the computer club here and this is the second year that she booked us for a week to present seminars and our hands-on Computer Boot Camp. This is a great place to go walking, and Roxie has 3 dogs! As we walk, others join us along the way. I guess we’ve traded in Happy Hour for ‘Yappy Hour’! We don’t have time to actually participate in many activities, but, during our walk, we noticed line dancing and were impressed by the large group. We did partake of the hot tub last night … and slept really good afterward too! Now we're on our way to Holiday Travel Resort in Leesburg where we're booked to do a week's worth of seminars, including our hands-on boot camp. Then comes the FMCA SE area rally in Brooksville. Then some more seminars at an RV park - Florida Grande. And last, but not least, a presentation at the Brevard County Genealogical Society in Titusville. See our website for the complete schedule. It feels good to be on the road, but it's getting cold again. Not the right time to be traveling north! Coming to you from the RV SuperShow in Tampa, we thought we'd share this little video to show what Jim is doing as part of his Work-Camping job with Paradise Island RV Park. And, if you're looking for a park in South Florida, you might be interested in the half price special at our sister park in Punta Gorda, Florida. In any case, watch the video just to see Jim, Marie, and Bill. Marie is the manager's daughter at Paradise Island, and she is such a cutie! So, we looked around the RV Show a bit yesterday. We saw motorhomes ranging from $80,000 to $377,000 – and didn’t really see anything we liked. We keep looking for rigs that have flexible floor plans – like the bunkhouse plans where we could take out the bunks and put in an office. It is so surprising to me that we don’t see any models with office desks already in them. I *know* we’re not the only ones that want computer desks in our RV! 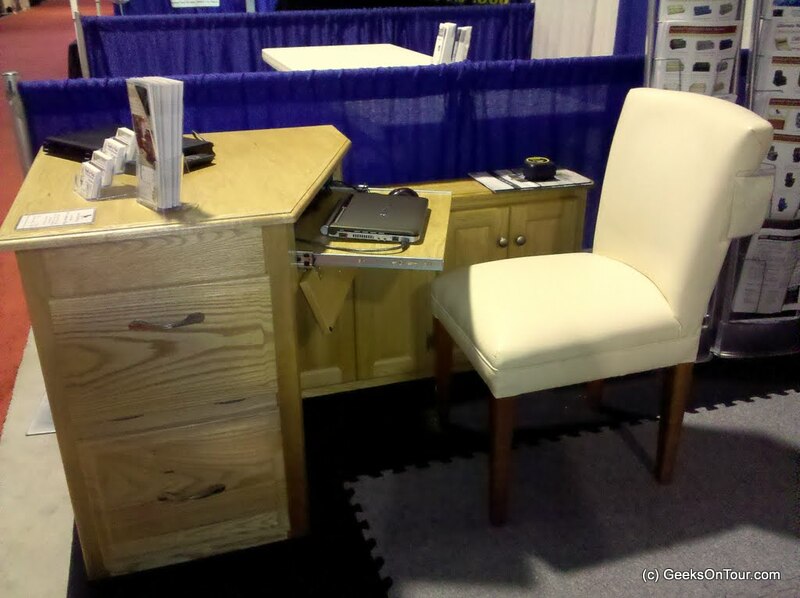 There is a furniture maker displaying their wares at the show. I really like this cool little corner computer desk by Brad and Hall. Guess who’s parked right next door to us?! Flakey! For those of you who know Flakey – aka Henry Gartner – you may have been worried about him like we were after knowing that he lost is sweet wife Kathy. She passed away early last year. We are happy to report that Henry is still traveling in his RV and doing his Flakey the Clown routine. He’s made it thru the toughest times, and his spirits are high as life goes on. He still has his bunny rabbits for company – and Odie was especially glad to see them. If you’re coming to the Tampa Super Show, be sure to stop by booth A35. 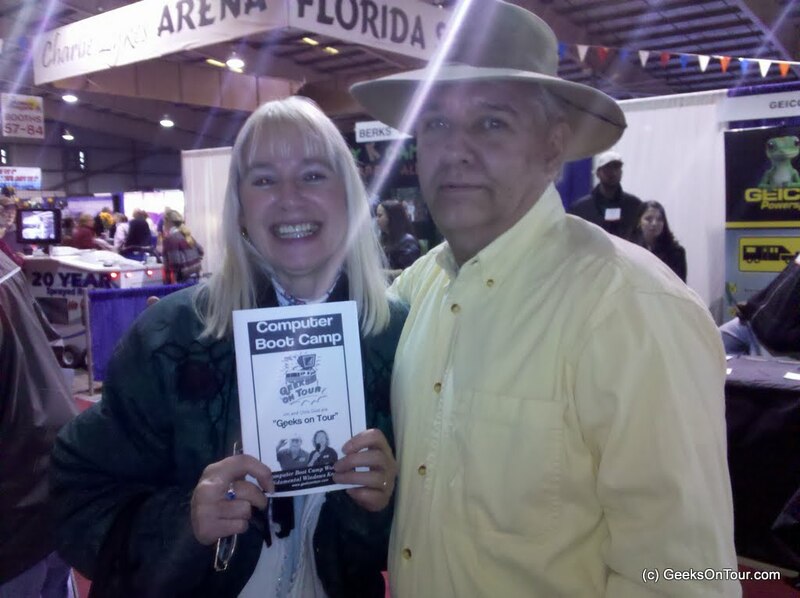 I’m not there because I’m working on the revision of our Boot Camp Book. So Jim is giving away our old ones – including a DVD with lots of our tutorial videos. Today is January 11, 2011 or 1/11/11. Cool. But I can’t say that today rates a #1 on any kind of grading scale. We are in Tampa for the RV Super Show. It sure did feel great to get the wheels rolling yesterday. Our RV hasn’t moved from our site in Fort Lauderdale since early last November. Here we are at our site for the week. Pretty exciting huh? It is convenient though … the exhibit hall is that building right in front of us. Jim will be working at the booth for Paradise Island RV Park all week. This is part of his work camping job. We’re not here as Geeks on Tour at all. It feels like we’re in cognito or something! If you’re at the show, you’ll find him at booth A35. The manager and a few others from the parent company will also be here, so I get to spend most of my time home at the computer and maybe get caught up with some development work. There is no Wi-Fi here, but the Verizon signal is pretty good. We especially like the floor plan that includes a bunk bed area in the rear slide. We would take out the bunks and use that area for office space. “The new year is a brand new journal, filled with blank pages. Every day I have the power to write my life’s story on those pages. At the end of this new year, what story will your journal tell? Will there be days of joy, and days of sadness? Probably, because that is what life is, a succession of good days and bad days. I hope at the end of the year, the happy days in your journal far outweigh the sad ones. 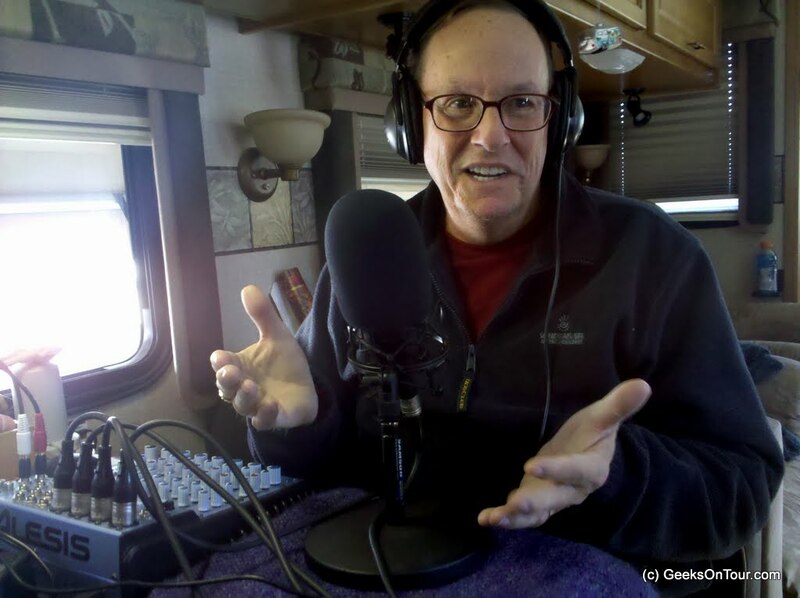 My friend Nick Russell wrote those words – he’s the best RVing writer I know and I take inspiration from his blog. This came from Gypsy Journal blog for New Years day 2008. We have plenty of adventure planned for 2011. Our rally schedule will be taking us to the west coast again for The Rally in Redmond, OR. See our complete schedule on our website. We’re hoping to spend some time in Nevada and California visiting friends before Oregon, and a visit to Glacier Nat’l Park after Oregon, on the way to Wisconsin. Right now I’m most excited about our online adventures. Since we are now using off-the-shelf software for our membership website(s) – that means there are other people out there who know how it works and can help! We are now working with a consultant and a Virtual Assistant who specialize in this software. I’m hoping this means that all those ideas of what we want to accomplish with our websites can actually get done! Primarily, we want our Computer Education for Travelers to be more easily accessible, and more useful. You shouldn’t need to learn how to use our website! We want you to use our website to learn how use your computer to Plan, Preserve and Share your Travels. So, our goal for 2011 is to make our websites so easy and so valuable that hundreds, no thousands! of people join – and we make plenty of money to continue living the life we love! p.s. we could use a new RV!